Could someone please let me have preferred water parameters, ie GH, KH, PH, TDS ranges. The water parameters for Betta are not specified because they can tolerate a very wide range. Hence people keeping them in jars with nothing but dechlorinated tap water. However if you are looking for ideal parameters, I would keep they in soft water. TDS: doesn't really matter. These guys can live in crap water (not that you should aim for crap water). But I would aim for under 350 like for all my other softwater fish. Most important thing is to give them a tank that is well cycled and has low flow. They do not prefer a strong filter and flow. 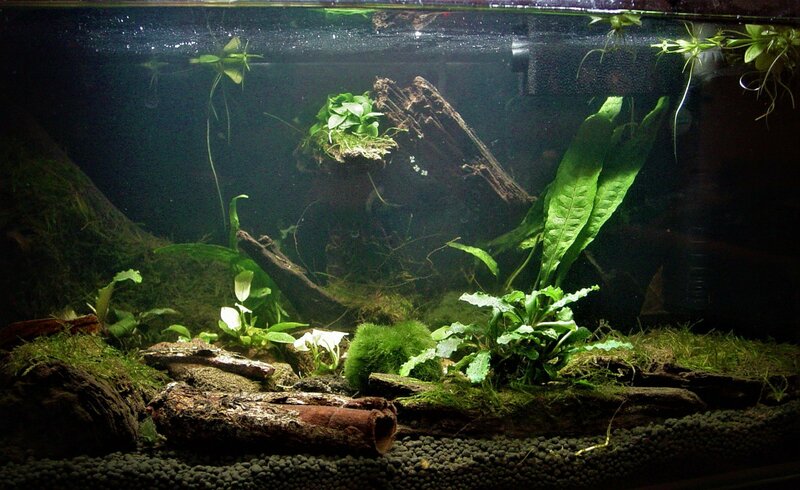 Some floating plants will also help them build bubble nests if you have females (note the plural. 1 female is not enough and will get harassed). If you are putting the betta in a 15L, then I would avoid females in the same tank until you see him building a nest. Apart from that, they are considered very easy fish to keep. Thanks JayC for the reply and finally what I wanted to know. I don't use internet much, but if I do I soon remember why I don't - not this site though which is why it is the only one I have joined! The Kh and Gh are a bit low on my tap water fish tank which would run the same but I could get some Gh/Kh+ to increase that (maybe that was why I did.t have much luck with them in the past) each needing +2 so that should be fairly easy fix with salty shrimp or dennerle GH/KH+ drops. TDS is 225 so adding +2GH would take that to about 260-280(ish) so looks like that also would be ok. The Ph with the drops shows as 7, though that obviously means it is more than 6.5 but less than 7.5 as the drop kits only goes per .5 differences, but I would add catappa leaves as I have those and betta are supposed to like them and it may reduce the PH slightly anyway, so that looks near enough for thumbs up as well. I am not interested in breeding so would just get the one male. That tank has a ridiculously slow filter/flow system (well it did last time I used it) so that also would be perfect I think. If I use water/plants/lava rock etc from the Fishtank, how long do you think I should run the tank before I consider getting the fish if you say 'well cycled'? I need to check if I have everything like heater/filter sponge/timer/extension cable etc before I can go any further yet (I will try and do that later), but otherwise from your reply I think it should be do-able. I guess using a tiny bit of Bacter AE as well at the start will help with the cycling, or will it be a good idea to use it all the time (I have it for the shrimp tank anyway so could do both tanks at the same time) I only dose that twice a week a lot less than recommended? THE OTHER QUESTION I NEED TO CONSIDER OF COARSE IS ONE WE HAVE ALL HAD, PROBABLY ON MULTIPLE OCCASSIONS, DO I REALLY WANT ANOTHER TANK TO RUN AND MAINTAIN??????????????? You seem to have right strategies to bring the parameters into line. GH/KH is flexible if you can't reach those numbers exactly. pH and TDS however, should be the priorities. 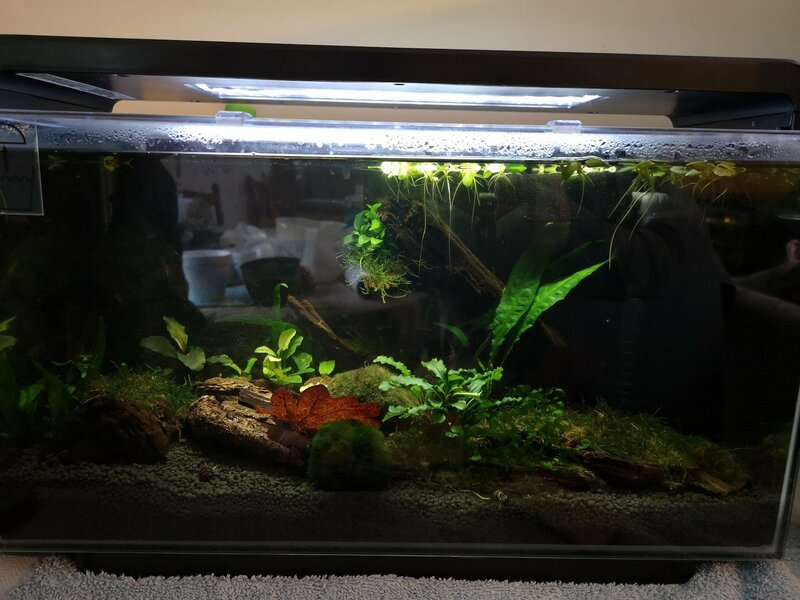 If I use water/plants/lava rock etc from the Fishtank, how long do you think I should run the tank before I consider getting the fish if you say 'well cycled'? That's not for me to say. I would just be taking a guess. A guess at how fast the beneficial bacteria multiply. Only way to determine if a tank is cycled is to test ammonia levels with a test kit. However, it will certainly be a lot quicker if you re-use stuff from an existing mature tank. Fastest way is to re-use the filter media from an existing tank, the dirtier the better. I wash my filters in new tanks - yes, it makes a visual mess in the new tank. But once the debris settles, the tank is well on its way to being cycled. Give the tank a warm 26-28 degreesC and the tank will be cycled in a week by washing your old filter in the new tank. As good as Bacter AE is, it cannot compete with re-using old media. I cannot help you there. I am in denial about suffering the same illness myself. I have cut down by 2 tanks this year. And I'm already thinking ..."I have more space now, and 2 empty tanks. I wonder what I can put in them?". Thanks again for all the great advice JayC. I did the weekly maintenance of the FISH tank today and have kept the old water (sponges were rinsed in it so nice and dirty) while I mull everything over. I checked the cupboards and have everything except an electrical adaptor - cheap and easy enough to get! Main thing now is whether I can re-arrange stuff to make room for the 15L tank near the new shrimp tank (probably wait until friends come round for that), as when I used it before it was on the dining table and that wasn't a good idea at all - always in the way etc, but it was only a TRIAL shrimp tank at that time? I feel more confident it should be possible thanks to all your helpful advice! Thanks for taking the time to do this JayC. I have this tank now set up and I am sure the 'cycling' has finished. I have put some cull shrimp and assassin snails in the tank for the moment and am expecting to maybe get a fish this time next week if all goes to plan. I have used JBL aquarium soil in the tank and there are lots of plants etc in the 25L new tank (actually has 20L water). My main concern is what do I do with the KH as clearly the soil is stripping it, so do I just stop adding KH+ elixir and therefore it will probably run at KH0 for a long time (until the soil is exhausted) , or do I keep adding Kh+ elixir thereby it will keep going up and down constantly whilst I fight the soil trying to get it to JayC figures above? The KH figure was 3 yesterday so I added some more Kh+ elixir hoping to get it to 4, and then when I checked it this morning it had dropped to 2 so I have added some more elixir but need to know where to go from here! I can't see that it seems to be affecting GH, but it may be at a slower/lesser extent I guess? I will be using tap water so there will naturally be some KH added each week which I will drip into the tank and do about 20% water change each week. If you plan to use tap, then keep adding the KH to the tank until the substrate exhausts itself. This way, you wont have unstable water parameters. The more KH you use, the faster the substrate will exhaust itself. If this tank is for a Betta, don't get too stressed out by the KH being a bit off. The Betta will handle it just fine. As the JBL substrate matures it will start to loose it's ability to drop KH anyway. Thank you both for your advice and I think I have managed to sort out what I will do which will be a bit of both! This week I will keep adding KH+ as much as I can to help exhaust the soil, it probably won't make much difference in 5 days but will set it on it's way. I will then leave it a couple of days to stabilize (probably it will go back to KH0) before I get the fish on sunday. Then I will do my usual weekly water changes with the tap water which will have some KH. I will do 20% and drip the new water in and hope that the fish can cope with the albeit small (1KH at most, probably less when dispersed in the tank) increase at that point over many hours, and then I guess the soil will absorb it back to KH0 within a day, until the soil is exhausted then it will very slowly start to go up but will be gradual. Thanks again to both of you and well spotted to JayC for picking up I was getting a bit stressed with it................. I really appreciate the help. DEFINITELY NO MORE TANKS AFTER THIS THOUGH - bet you've heard that a few times???? One more quick thing as I keep forgetting so have to do it whilst it occurs to me. Should I use the 'Humin Fluid vital' for the betta as I have it for the shrimps anyway? I have been meaning to ask for so long I can't even remember what made me think it may be a good idea????????? All is now up and running so will have to see how it all goes (water parameters are nowhere near the ideal of JayC so not getting too excited yet), there are brown cull shrimps and a few assassin snails also in the tank. I have noticed there are hydra also in the tank so will be treating for that but that is on another post! Very nice tank. That betta will love it. Thanks JayC, and I mean that, I almost certainly wouldn't have had the courage to try again without your input. Early days I know, but day 2 and he is still alive and very active! I am still at the 'take a breath each morning before I get near the tank to see if it is still alive! I have done so much research, and doing so much differently this time that I feel like it should work. I like the tank setup as well (shame about the hydra but that SHOULD be an easy fix, in theory) but that aquarium glue made setting up the tank a whole lot easier, just glue plant to rock etc. I sent my friends down to the lake here to see if there was any daphnia and they came back with a bucket full, I was stunned as it is cold here so thought they would still be dormant. They took most of the daphnia for themselves, and both of us will see if we can 'culture' our own (mine is already set up, feeding it a little yeast) but I don't need many for 1 fish anyway, but Bertie enjoyed half a dozen yesterday. I am also trying worms but no success there yet. Anyway, basically doing so much different this time that hopefully it will work? Bigger tank, reduced flow filter, live food and bug bites, upping GH, KH, adding Humin fluid, Indian almond leaves, alder cones etc etc. Thanks again for your helpful advise and support. ps Friends were amazed at the Taiwan bee shrimps, I think I can relax with that and feel like I have mastered that! Glad I have been of some help. 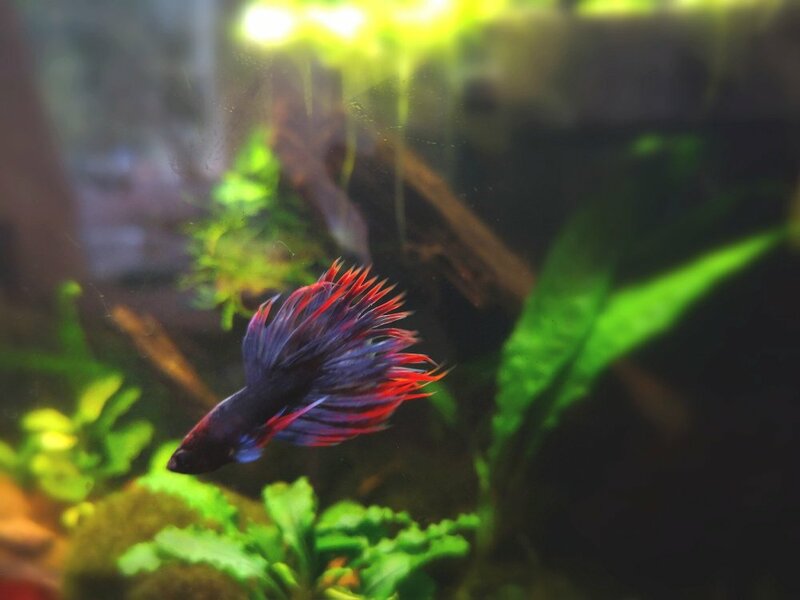 I know of at least 2 other people that have named their Betta, Bertie. I 'suspect' my Betta may have Popeye, he is quite small so difficult to see but he seems active and chasing food etc! Is there an easy treatment that I can use in case? I am guessing using Epsom salts will affect the shrimps and plants? I also read (partly on here,but elsewhere as well) that Melafix doesn't work and can actually injure the fishes air breathing organ??? I do have an old 15L tank that I MAY be able to setup/use in the kitchen with no substrate etc, so can do multiple water changes (if needed), but it won't be 'cycled' or have filter running but I do have a spare heater and light (I think). Please bear in mind my physical abilities are extremely limited. Also any medication etc will have to be through the post so that will cause some delay? Anyway all advice will be gratefully received? Update 17/4/19 - I have decided to try 50% dosage of melafix for 3 days (then review to maybe doing a further 4 days) at next water change/maintenance on friday! This is based on a whole day reading on internet and 3 days is recommended as 'preventative' dosage, but most seem to think full strength is too much for Betta? He seems spunky enough and active? A picture of the Betta tank and a couple of the shrimps. The Betta watches them sometimes but never bothers them but they are so well camouflaged I doubt he sees them much. I only got to see them as I put a pea in the tank. Hi all, haven't really been on for awhile due to life's challenges that get thrown our way from time to time but have thought I would jump on and ask for some suggestions on the following. My Mum has a bright red Betta that she adores and it's currently in a 12g that I use to keep all my shrimp in, well the Betta took care of them all and I'm in the process of making it back into a shrimp only tank with just Anubias on driftwood and Moss, so I am after some suggestions for an all in one nano set up for a Betta, I've looked on eBay and haven't found anything I really like or should I say trust that won't break as some look quite cheap and would like to buy her something decent that will do the job well, checked out the Fluval Chi but think the lighting is quite poor though, so think that's out of the question also. Anyway, if anyone could give me some suggestions it would be greatly appreciated, thank you. So today while visiting a friend who works at my local fish shop I could help but buy a couple of Bettas they had there, we've been talking lately about Bettas they plan to breed. I've got them in they 5-bay I sumped over my shrimp tank till I set them up a better tank, lol. I'm not sure if anyone will see this, but I'll give it a try! I'm currently having some issues with my male Plakat that is 10 months old. I have a 20 liter tank, heated, with a 30cm pro z led light. The tank used to be scaped but he began to look unwell. We have another empty tank so I had him in there for about a week and he got better. Basically I've been putting him back and forth between tanks until I ended up taking everything out and he had a bare bottom tank with some rocks anubias and moss. This has gone well for about a month but yesterday he appears for a better word, lethargic. He seems to be spending a lot of time towards the top of the tank. This is becoming highly frustrating as I am more than happy to have a nice landscaped tank for him but he doesn't seem to like it. All water tests have been very low as I give him a small amount of fresh waster daily. I've tried straight tap with Prime, RO with equilibriam and a mix of both. There are always IAL in the tank also. Any thoughts/help/comments would be greatly appreciated!